The other day my friend Liza came over and rearranged the living room of my flat in hopes that some impromptu feng shui would bring back my writerly mojo. We surveyed the new desk-by-window set up and saw that it was good. So we rested. And by resting I mean we cracked open the Cantillon Kriek from my stash, in partial solidarity (and a tinge of jealousy) with the Beer Nut who just returned from visiting the brewery on an open brew day there. When I drink Cantillon I feel like I’m inside some crazy beer time machine. Ancient fermentation! The mysteries of wild yeast! Arcane blendings! I will never not be in the mood for this beer which makes me feel just sophisticated enough but also earthy, like a rosy cheeked clog dancer in a Breugel painting. We ate it with some cave-aged gruyere and too many olives, and our tasting notes consist of only Did kool aid have a red sour patch flavor? and, more tipsily, Hey Kool Aid! Bustin’ through your wattle and daub in his ceramic pitcher. yo. Last week I went to Brussels on the Eurostar. I stayed in a swanky five star hotel and drank myself silly. After being unemployed for so long it’s hard for me to really take the apocalyptic money talk of the banking crisis seriously. I have so little to lose I might as well spend it. On beer. Beer has become an excuse for me to have adventures. The best beer is of a place: a way to literally drink in wherever you find yourself. Before going to Brussels the only Belgian beers I’d tried were the kind you can get in those aspirational gastropubs in London that serve Hoegaarden, Leffe and Fruli. Based on my sampling of these I thought I wouldn’t really like Belgian beer and would have to stick with Chimay, or maybe Orval which I’d had in bottles. Boak was good enough to share with me a last-minute list of recommendations, which I elaborate on here. One especially became a haunt of mine. A la Morte Subite or “Sudden Death” is a cafe with its own range of beers named after a card game that bank employees who drank there would play. I fell in love with their gueuze which was extremely tart with an almost vinegar pucker. It is the most sour beer I’ve ever had. I exclaimed to the waiter who seemed a bit worried that I had ordered the “difficult” beer, “This is amazing!” He winked, “There’s more if you want.” I liked this place. I also thought their lambic was impressive– it had a creamier mouthfeel with a white peach overtone. While there were a handful of tourists here at any one time, most of the people seemed to be locals, passionately engaged in conversations I couldn’t understand. The faro and kriek were also quite good if a bit too sweet for me. Another stand-out beer was the Girardin Kriek which I had at a lovely cafe called Het Warm Water. This place served creative dishes that were light and flavorful. The kriek I later found out was made with frozen cherries but this didn’t seem to matter as it was delish. It had a buttered popcorn and myrrh nose, redolent of the decadent, foodie perfumes from Black Phoenix Alchemy Lab. 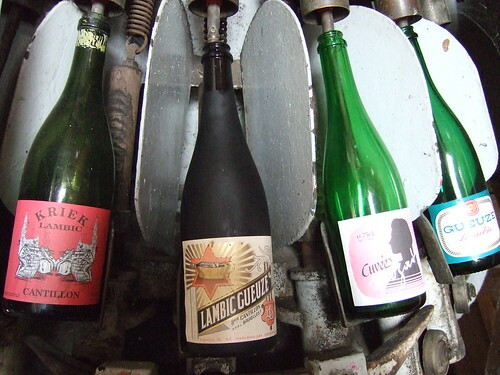 The cherry was a halo-presence with the lambic’s grain-wine flavor taking prominence. The tang was upfront, with a light butter-caramel finish above the sourness. The most remarkable beer of the trip came from the Cantillon Brewery, which is a working museum. 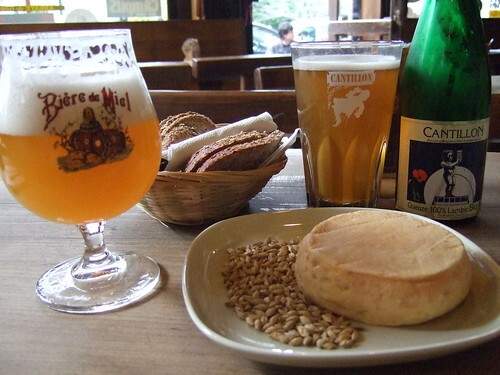 There is a self-paced tour which is punctuated by a sampling of the different beers made there, and a very knowledgeable woman was able to answer all our questions and suggest other places in Brussels which had stand-out beer. I was charmed by the plentiful spiders and webs in the brewery which are a natural way for the brewery to keep the insect problem in check. Also, the attic-like room with a large copper bath where the wild yeast innoculation takes place had the feeling of a chapel or sanctuary. There was a small crowd in the tasting area: an American guy with an Obama hat, a French couple and group of Irishmen all sipping contempatively– this was more like a wine tasting. Some people were wincing and frowning, and with good reason– this beer is intense. 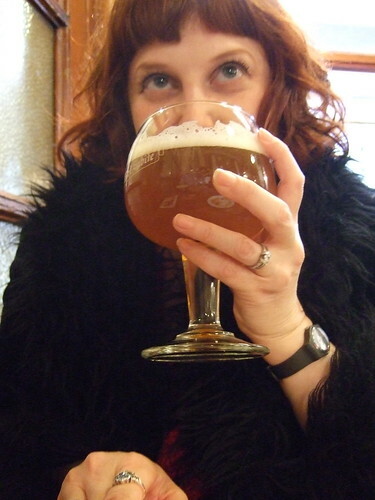 The gueuze had a musty, animal fur nose, with a hint of wood. It was extremely acidic, but unlike the other gueuzes I’d tried, I could taste the hops in this which added to its perfect dry finish. 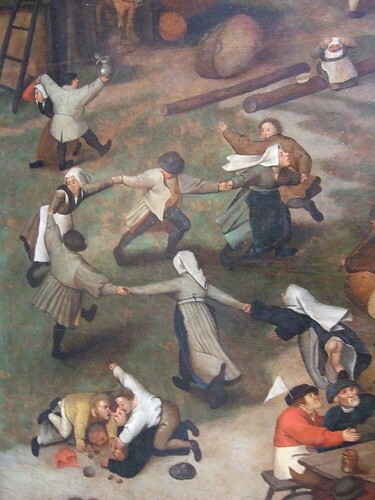 The kriek brought back an olfactory memory– my mother giving me a permanent wave as a pre-teen. Though this brew was candy-colored, all the sugar had been fermented out leaving only a kind of “attar of cherry”– the essence without the sweetness. A dutch couple gave us their faro to sample and we didn’t care for it. There was a note of vegetal rot that was hard to get past. The lambic was pefectly flat and oily, like a grain wine– I said how wonderful it would be with cheese so the woman at the brewery recommended we go to Moeder Lambic. Chez Moeder Lambic is beer heaven. 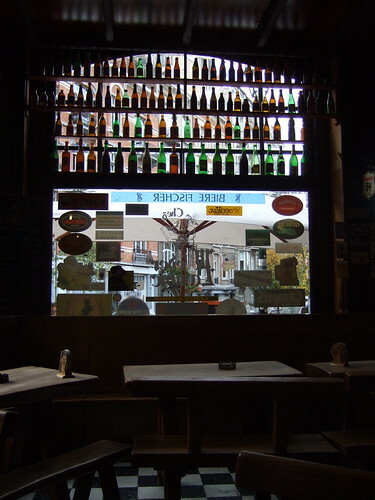 They have several interesting beers on tap in rotation and hundreds of bottled beers to try. I tried the Cervesia, which was made in the “old way” with herbs instead of hops. It reminded me of a lighter, sweeter verson of Froach. The friendly owner and server were happy to go out of their way and recommend beers and locally crafted cheese to go with them. Across from us, a table of guys ordered Jupiler, a beer that was as common as Stella Artois (I assumed it was lager-like and didn’t try it.) Moeder Lambic didn’t have this beer so the bartender recommended another and when one of them tried it he actually shivered and shook his head. This really isn’t the place to have, in British terminology, a “session” drinking something “quaffable.” Though I am sure there are some easier beers at this place, I wasn’t interested in them. If you do find yourself getting tipsy the only food you can get here is cheese. And what amazing cheeses they had! The cheese was served with barley and fresh bread and the one we ordered had been, in the words of the waiter, “Showered in beer”. As we drank round after round the cheese warmed and our corner of the cafe was filled with the ripe, earthy smell. The standout beer for me was the Oude Kriek, almost black in colour, this Lambic was blended with fresh cherries by a one-man operation– Karel Goddeau. The bottle was dusty from being aged and we laughed at how we must have looked to the locals drinking– two Americans taking notes and photos and drinking dusty beer. But it was some of the most beautiful beer I’d ever had– so far away from any modern notion of “beer” that to drink it was to feel transported to a time when beer was a miraculous gift of something wild and mysterious visiting from the air.